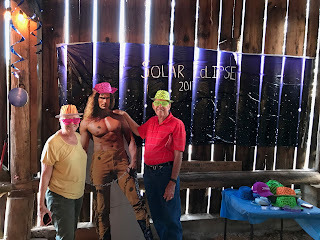 RETIRE IN STYLE BLOG: 2K17 Solar Eclipse Party: The Last Hurrah? 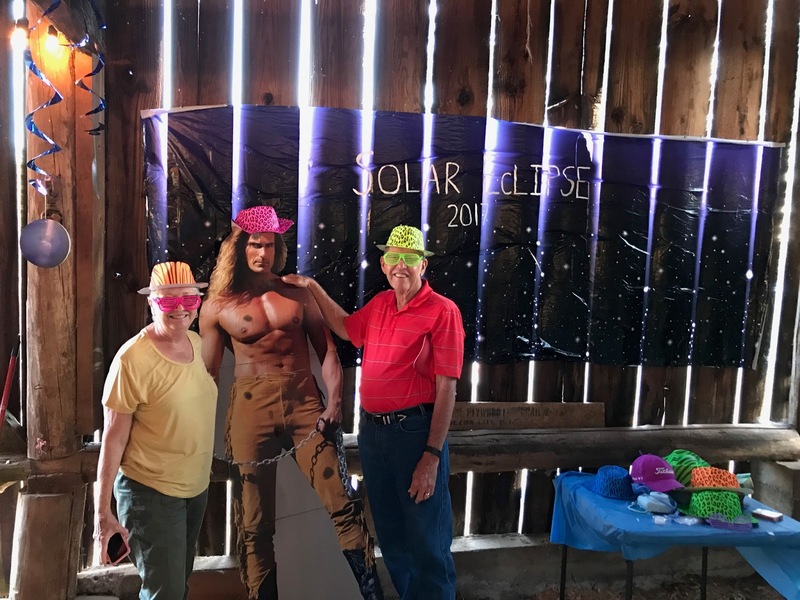 2K17 Solar Eclipse Party: The Last Hurrah? I had a friend that began every occasion with a declaration that it was her "last hurrah". Her name was Anna Mary. She was very old and yet she seemed so young mentally that it was hard to even recognize what she was enduring physically. She was a widow and lived alone. I think of her often these days. I remember telling her one day, "No it's not your "last hurrah" Anna Mary...you are not even near to that time." 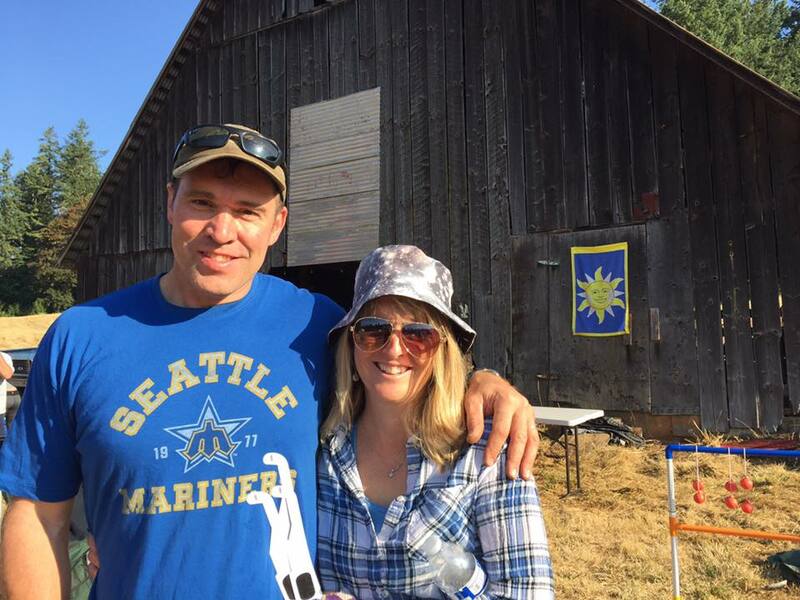 We were invited to a Total Eclipse 2017 Party this weekend and as those few day unfolded I was reminded Anna Mary's eventual "last hurrah". I am drawing closer and closer. Here is the story. We have friends that are younger than we are...perhaps a lot younger although it is hard to tell. Almost all their children are graduated from high school and some from college. Still, most of our grandchildren are about that age so there is that. I became acquainted with the women at the swimming pool when my grandchildren were in grade school and I was those children's stay at home babysitting Grandma. That was so many years ago. My grandchildren are 24 and 20 now. As it turned out my daughter shares these friends with me so that is wonderful. Kristine was one of those women. Her husband Lee coached my granddaughter's baseball team. When it came time for Lee and Kristine's "Total Eclipse Party 2017" my husband and I were invited and our daughter/husband let us sleep in their camper. 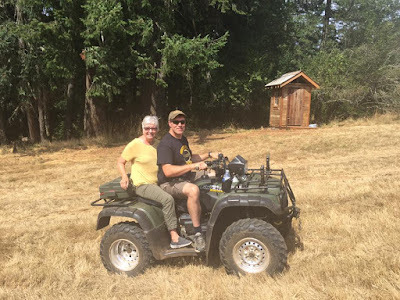 All of the guests pitched tents in the pasture of Kristine's country cottage located near Lyon's Oregon. Quite a crowd had gathered by Total Eclipse 2017 Eve. The barn where we danced, ate and gathered. The trailers are where we slept. The pasture filled with tents the on eclipse eve. It was a big party that lasted for several days. People hiked, talked, ate and danced in Kristine and Lee's barn. Music played until late in the night. 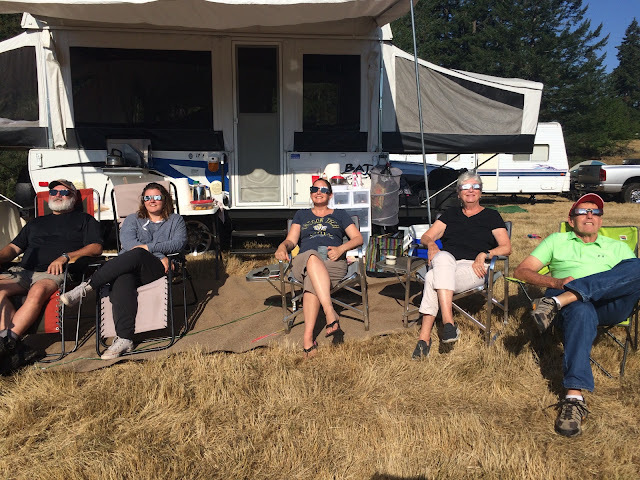 As the sun came up on Monday morning, August 21, 2017, we all put our perfectly safe eclipse glasses on to watch a miracle unfold. With no camera capable of capturing it, we were forced to capture the images in our minds. As the sun disappeared from sight and only the corona around it glowed, we stood and cheered. The stars emerged and it became cold instantly. What we had all waited for was gone in such a short period of time I didn't get to notice everything I had planned on seeing. The air warmed, the stars disappeared and the pasture came back to life. It was almost a religious experience. So here is the "last hurrah" part. 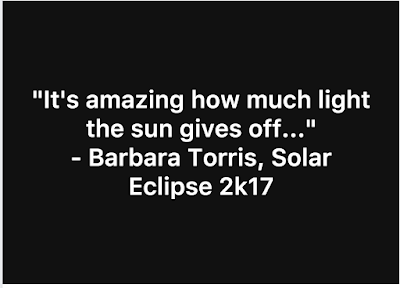 I know that most of those people and their children will be alive to witness the next eclipse on April 24, 2024. That is only 7 years away. I am almost 76 and my husband will be 80 in February. I was tempted to repeat Anna Mary's "last hurrah" speech but, like her, we may be around to see a lot more than we can dream. Who knows how many "last hurrahs" will pass in years to come. What a privilege the whole thing was. 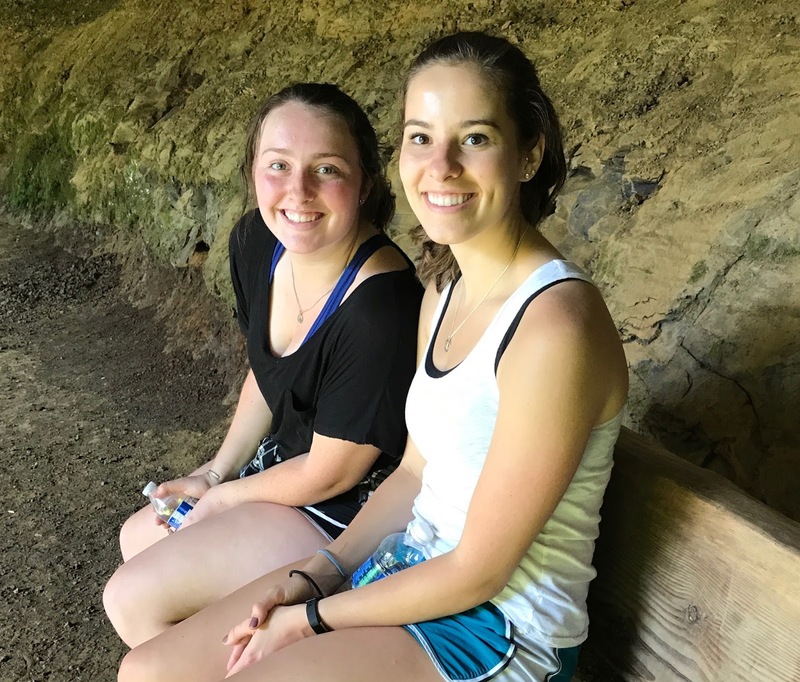 I took a hike a 3 mile hike with my daughter and my husband outdid me on the next day by going with her a lot further. I talked to a bright 9 year old (Lucas) who explained to me why he didn't like being in a mixed age classroom. Children that were in the classroom I volunteered in 15 years ago were there and I met a boyfriend of one (sweet Katie) that is rumored to like grandmas. We sat and talked with Kristine, Jill, Lucas, my family and Kathy and her husband Bret after everyone else had left. It is hard for me to find that one single moment that touched me the most. See, eclipses are wondrous but people just wonderful. it on Facebook. But stop....I can explain! Elena for not laughing at me too much. Thank you for the hugs and the talk and most of all the laughter. How did we get to be so lucky. Sweet Katie (left) and Marissa. and before a good old fashioned potluck. The crowd spilled out of the barn door into the field. Fabio has been following this group around for years. He has been to Mexico, Las Vegas, anniversary parties, birthday parties and Jewel, Oregon ( the best place of all). My daughter and I hiked to the falls. Our cute outhouse Lee constructed for the event. See you all in 2024!!!! We will do it again! How did Grandma and Grandpa get to be so rich? I remember seeing the 1979 total eclipse in Oregon (I lived in Wichita, KS at the time)and thinking how far away 2017 was. 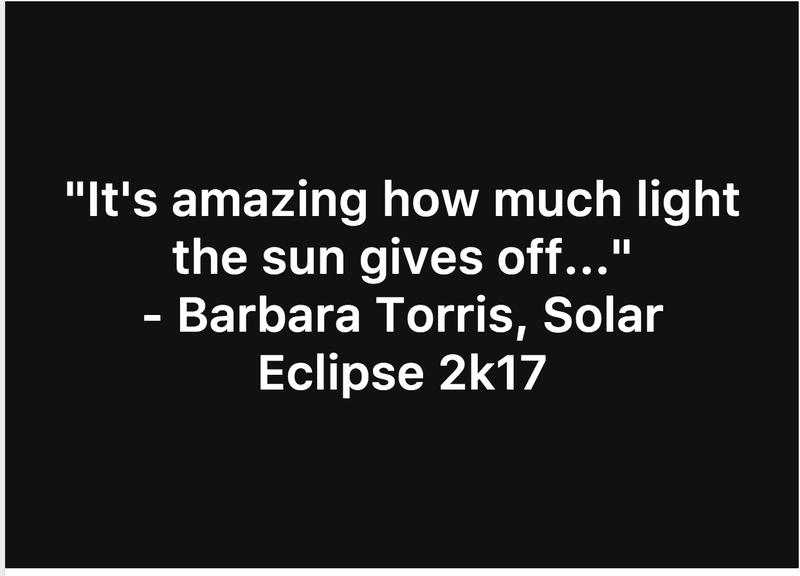 I never realized I would watch the Monday eclipse with my husband of 43 years and my grown son; I never could have imagined. But, seeing a couple of elderly women in wheelchairs made me think....a lot, about if I would be around for 2024. The party you went to sounded wonderful! What a beautiful tribute to an amazing group of people and the phenomenon that brought them all together... I know Leland's mom and knew him only when he was a little baby...Look at the amazing man he's become....You have a been gifted with a special life it seems!! !